Pneumatic Linear Actuators | Baelz N.A. Pneumatic actuators convert pressurized gas into motion, enabling significant force to be channeled from relatively small variations in pressure to operating systems of all kinds. Offering precise, powerful response, these actuators are critical for flow system management and main control systems. Pneumatic actuators join electric linear actuators, motorized rotary actuators, stepper motors, and hydraulic cylinders to round out a full catalogue of specialty actuator solutions at Baelz North America (Baelz NA). Highly responsive pneumatic actuators draw energy from vacuums or compressed air, converting high pressure energy into rotary or linear motion in a control system. Because this design doesn’t require reserve power, it’s ideal for the quick response demands of main engine controls and flow systems. Its simplicity, durability, and straightforward operation make the pneumatic actuator desirable for high performance applications in a wide variety of industries. Pneumatic actuators are often paired with valves and diaphragms for precise liquid and gas flow management. Known for safety, cost effective performance, and continuous reliability, the compact power of these components is also found in combustible engines, pumps, ventilation systems, switches, pneumatic nail guns, heating systems, air compressors, and countless other systems. 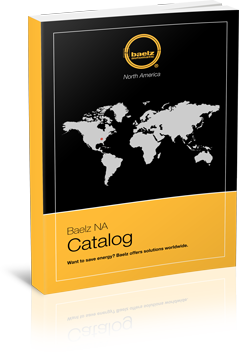 Dedicated to building cost competitive, energy saving parts and engineered systems, W. Baelz & Sohn GmbH & Co. works with Baelz NA to bring custom components to North American customers. The team offers a full family of actuators in addition to heat exchangers, control valves and controllers, automation skid packages, assemblies, and more. 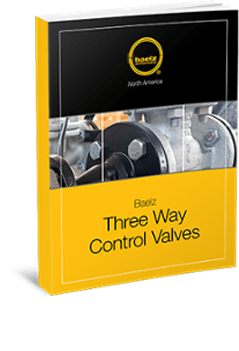 Baelz Automatic has stood for quality since 1896. We’re proud to provide this tradition of high quality backed by all the benefits of local service, with dedicated specialists and short delivery lead times to get the components you need, when you need them. For customization assistance or to learn more about our catalog, reach out to the team today.